When I inherited a HD Sportster XL 1200 built in 1997 2 years ago, I finally had a real hobby for the first time in my life. My new, old, well-kept treasure was usually moved straight ahead or at most maneuvered through long curves. The “pretty Lola”, as I call my Sporty is cumbersome and also I’m a chicken when it gets curvy. So it’s time for a “Face Your Fear” turn training and my “therapist” and pacemaker Flo drives ahead with his Ducati Monster, which is faster and much more agile. Our destination is the Dolomites, where I have always wanted to go, and we choose only the most winding roads and passes. So we hit the road as an uneven team in terms of speed in Feldkirchen in Carinthia and if we had known that we would sit 9 hours on the machines, we would rather have left earlier. But the journey is the reward, right? Through Villach to Hermagor is almost our home route and I like it personally, because you can drive quickly – the Karawanks on the left, the Dobratsch on the right. After Hermagor we take a turn at Tröpolach and arrive at our first mountain pass – the Nassfeldpass. That’s a lot of fun and on top we cross the state border to Italy. A serpentine road leads downhill to Pontebba – and I thank myself that I have renewed the brake pads before. After driving around in a circle through in the village, we finally find the exit on our next favorite track – the channel valley on the SS13. Who takes the highway here, is himself to blame. At Tolmezzo we turn off at the the exit and thanks to the confusing signposts and without navigation we drive twice in a circle again, before we find the right way to Mediis. 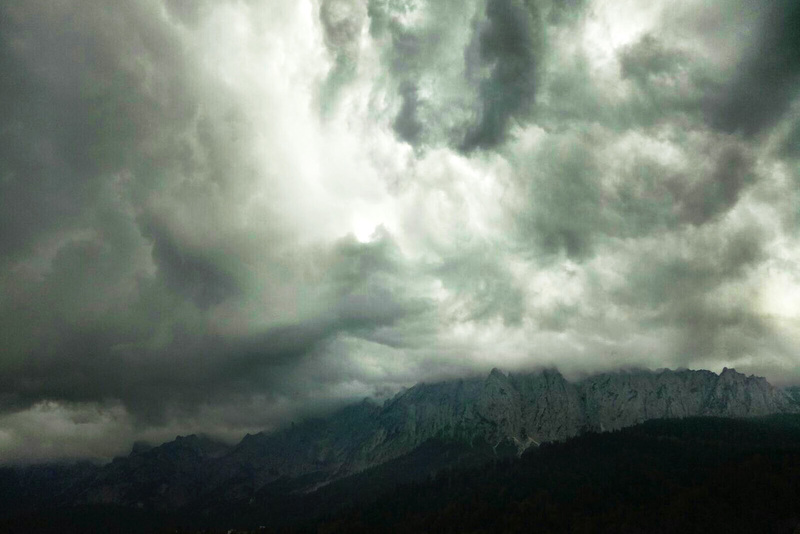 The clouds hang low and dark, but we manage to get away from the rain. From Mediis it gets exciting. We take an easy to overlook junction to the mountain pass Forcola di Mont Rest (1052 mt. ), of which I have never heard before. Obviously many have not heard of it either, because only rarely have we met other people. Which was good, because the road is narrow and has many hairpin bends – fabulous! After about 40km we pass Tramonti and continue to Meduno, Maniago and Barcis. We can already feel the Dolomites … In Longarone we puzzle over how we should continue but thanks to a couple of bakers and basic Italian we find the way to Ponte nelle Alpi. It is already dawn when we drive through Belluno and it still takes about 1.5 hours to reach our accommodation in Mis / Agordo. Actually, I’m tired and exhausted, the mood is a bit tense. But we have to keep going. When we arrive in Mis, we can not see the mountains any more. We eat the world’s best pizza in the only restaurant in town and fall to bed. Next morning we see a spectacular mountain scenery around the house and look forward to the tour. No fewer than 7 passes are planned for today! From Agordo we take the SP347 to Passo Duran. it is winding up and down between mountains and cows to Dont. There we turn left on the SP251 and are already on the next pass – Passo Staulenza. 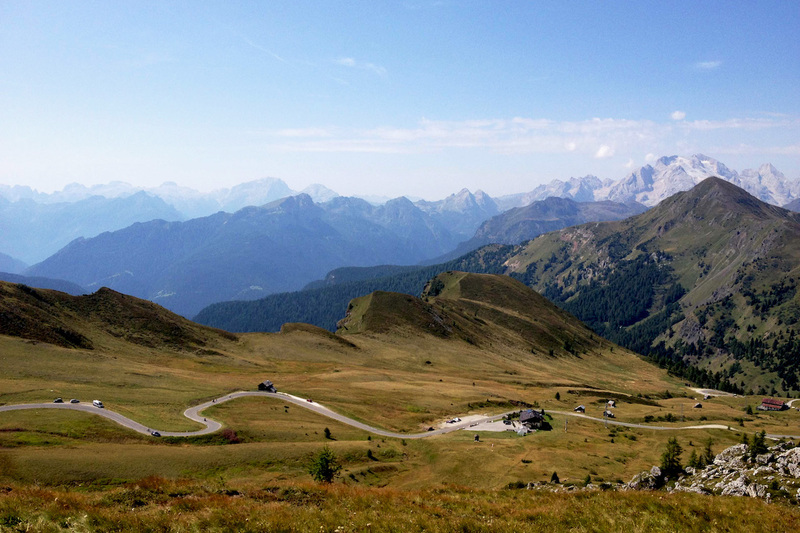 In the village of Selva di Cadore we keep to the right and go to the, in my opinion, most beautiful pass – Passo di Giau. 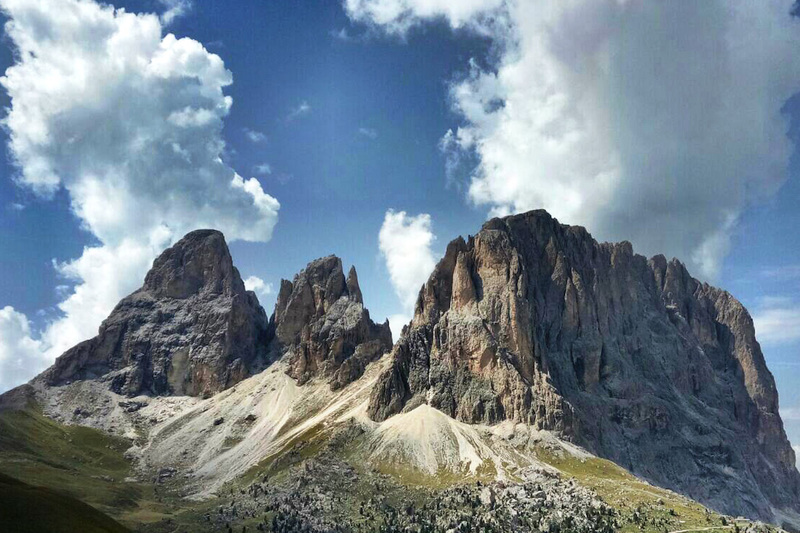 If you explore the Dolomites, you will not miss it – a super route embedded in an impressive mountain landscape. 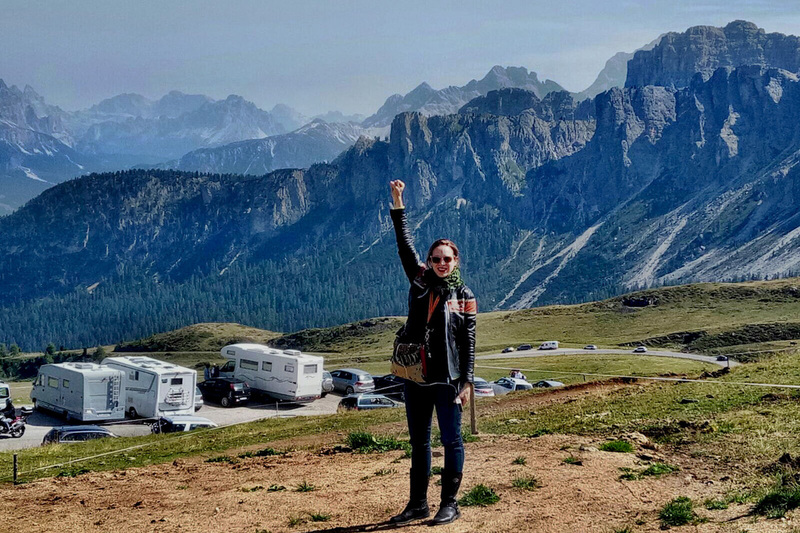 Here we also realize that we are not the only ones traveling by motorcycle – it’s a true paradise for bikers, but I’m an exception with my Harley. After a short rest, we go downhill to the next Passes: Passo Falzarego and Passo Valparola – also very beautiful, also very bendy. From the village of Stern we continue to Passo Gardena (Gardena Pass) with a beautiful mountain scenery. You feel like an ant between the mighty rock. We enjoy the sight for a while and continue on the Passo Sella and Passo Pordoi. Slowly it gets difficult for me to greet the many motorcycle colleagues nicely and cornering gets more and more exhausting with my Sporty. But because we have to go back to Mis, which is located at Passo Cereda, I pull myself together again. We dash over Arraba to Agordo and finish the day again with the world’s best pizza in the only restaurant in town. 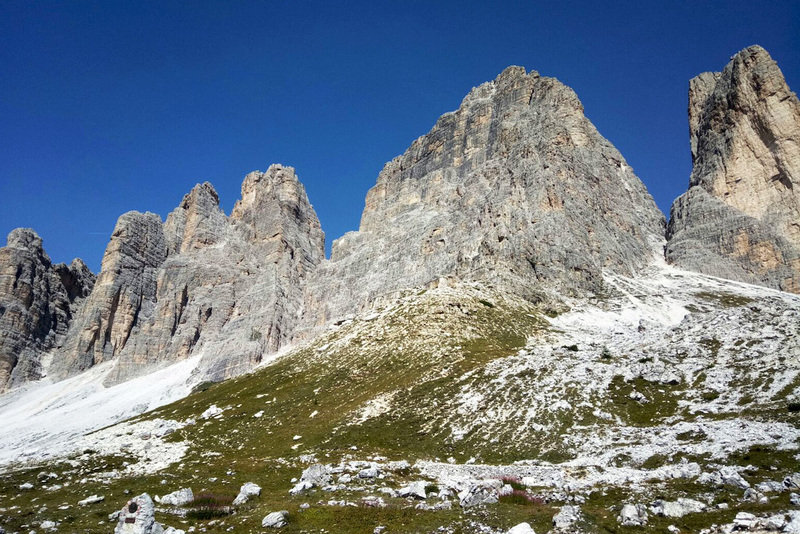 We leave early, because today we finish at Tre Cime di Lavaredo. Back along the Passo Duran, which we now know very well, we turn right at Dont to Forno di Zoldo and then immediately on the SP347 to Passo Cibiana. Curving is a lot of fun and there is hardly any traffic. Although we would rather continue on small roads, we take the road to Cortina d’Ampezzo to get ahead faster. Cortina itself is a huge hustle and bustle, even though the winter season is still far away. I would love to explore the place, but the mass tourism is too much for me. I think of Peter Sellers, Pink Panther movies and what the place must have been in the 60s. We leave Cortina in the direction of Tre Cime di Lavaredo with a thousand cars – it’s Sunday, the sun is shining and all Italians are out for a ride. At Lake Misurina you have a great view of the Three Peaks, although from this point of view it looks more like Two Peaks. We treat ourselves the toll on the mountain and arrived at the top we walk a bit with the crowd. Since we still have it a long way home, we say goodbye to the Dolomites after an hour and drive towards San Candido and Sillian. On the track you can still see the Three Peaks from the other side – they are really vast! As a nice end to our tour we choose the route through the Lesachtal. The route is not so mountainous anymore, but the area is beautiful. At Obertilliach we stop briefly and look at the countless hay huts scattered around the village. The road to Kötschach-Mauthen is very winding and difficult, you have to be really careful. On the right side it goes steeply downhill, there are only poor guardrails and the road is pretty bad. At Kötschach we follow a French biker group and drive back to Villach quickly. 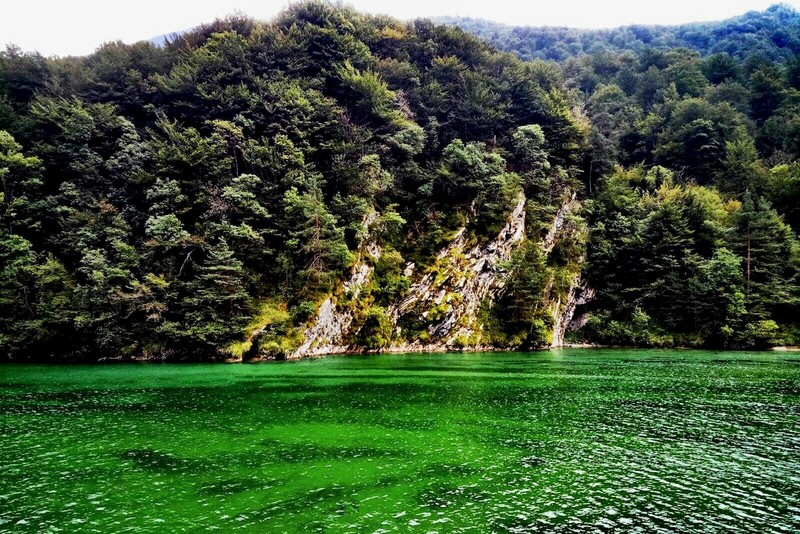 Shortly before our final destination Feldkirchen, we have earned a dip in the Ossiachersee and then we fall off our bikes. Conclusion: a great tour with an impressive mountain backdrop and a true dream for bikers who love curves.